In 2004 I moved to Cornwall and met Bridget Woods Kramer, a certified Anusara teacher. I loved her classes and began training towards becoming an Anusara teacher. I have trained with Bridget, John Friend, Jayendra Hanley, Jim Burnart, Bill Mahony and Carlos Pomeda. 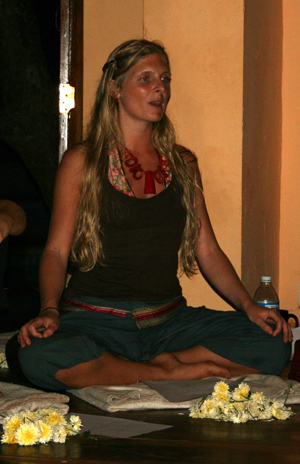 In 2012 I gained an Anusara Inspired teaching qualification (Yoga Alliance accredited 200hours.) I have also assisted Bridget on her teacher training program, becoming a teacher of teachers. I am currently undertaking a 3 year course to become a certified Anusara teacher, one of the most well respected qualifications in the yoga community. I have studied pranayama and yoga philosophy with Clive Sheridan and Rose Baudin and Rodney Yee. My deepest gratitude is to Buddhist teachers, Sangye Khandro and H.H The Dali Lama for it is through them that in a moment of grace a knowing was awakened within me. I will forever be grateful. I have 2 children: Leela and Tulip and it was after the birth of my first daughter in 2009 I trained in pregnancy and then mother and baby yoga with Uma Dinsmore Tulip as through experience, I knew how useful yoga techniques could be for women at these times.